Identifying Topics – What Could You Write a Press Release About? The short answer to that question is ANYTHING. But what is newsworthy? Think about what your company is doing right now that you are excited about. Example: An Insanity workout instructor who is traveling to a conference where she will meet and work out with Shaun T, the creator of Insanity. Cool, right? And getting publicity could attract more people to her classes. Connect a trend, study, social issue or current event to your business and area of expertise. Example: Real estate agent and home buying/selling trends, Local group knitting hats for political protests.Trends in consumerism, or studies on health topics. A How-to or Check List in your area of expertise – Examples: Hula Hooping How To – (connect it to the circus being in town, then mention that your gym offers classes) Financial Planning tip list, scrapbooking tips from a consultant or paper supply store – create one page a month for a year – connect to National Scrapbooking Day. Anniversaries, milestones – Celebrating a year in business or 10 years?, Reached a certain number of clients? Met a sales goal? New location or additional location? Holidays/Seasons – President’s Day, Easter, Mother’s Day, Memorial Day Longest Day of the Year, Shortest Day. Seasonal Promotions/giveaways, Spring flowers, April Showers, Filing Taxes – financial planning, get fit for the summer, etc. Awards, Recognition, Good Work in the Community. Supporting a Cause or Making a donation of product or services – Awareness Month such as February – Heart Association, Autism Awareness Month, Breast Cancer Awareness, Charitable donation. Example: a local Landscaping company that donated a tree to the park for Arbor Day – made a donation and did a good deed and was recognized in the newspaper with a photo. The list goes on. Sponsoring an event or contest. New Business or Old business with something new to offer such as a new product or service. What are you doing that is innovative or unique? Launching a new website? Don’t Be Afraid to Toot Your Own Horn! So, Once you decide on a topic to write a press release on, where do you start? Think of the format as a funnel with the top being the most important information first. Your Logo / Letterhead – contact person and phone number/email should be at the top. Headline – hook the reader in, why should they continue reading? Encapsulate the entire release and boil it down to 8-10 words. Leave out “and” – use a comma instead. Bolder and bigger than the rest of text but still on one line. Subhead – A 2nd punch with a bit more information that expands on the headline – still bigger than the rest of body text but smaller than header. Dateline – City/Town in caps – helpful to identify where the release is coming from. Lead – Most important information first – who, what, where, when, why, how. Make the editor or reporter want to read more. Body – a few sentences of description and detail. Paragraph of 2 to 3 sentences but no longer. Quotes – add value and human interest. Attribute to a source, you or a satisfied client. Real words – how a person would speak. Fun, Quirky, heartfelt. Boilerplate – One or two sentences about you and your company. A call to action or request. – Close with a strong incentive for the reader. One page is usually plenty. Keep it brief and easy to digest. State if you have photos or graphics available that can be provided. A press release is not an advertisement so keep “I, You, We” out of it unless it’s in a quote. Stick to facts. No exclamation points! Avoid jargon – spell out acronyms on first reference if used. Target to the most appropriate newspaper section editor (Business Editor/Lifestyles/Health) or to news director/assignment editor at TV stations. Newspapers, TV, Radio – Media websites list contact information to send press releases to as well as preferred format. Email. Phone follow-up. Local/National – TU or the AP? Magazines in your area of expertise. Media Advisory – Short – who, what, where, when, why, with directions if applicable. Photo Opportunity. Send the day or two before an event to generate coverage. Since it’s up to the media’s discretion, there’s no guarantee of coverage, but keep submitting. Strive to be timely. 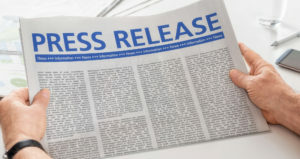 Connect your business to current events or social issues and make your press release or letter too interesting to pass up!